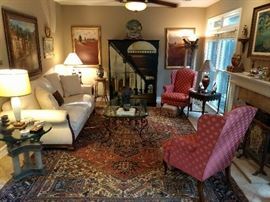 Lovely living room, with lot's of art, anchored by a 10' x 13' Persian Heriz rug, pair of wingback armchairs, hand painted Italian chest, torchiere & matching side table, heavy wrought iron/beveled glass coffee table, etc. 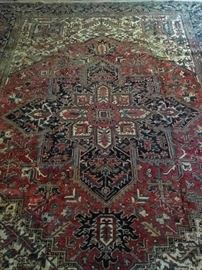 Gorgeous vintage Persian Heriz, hand woven, 100% wool face, measures 10' x 13'. 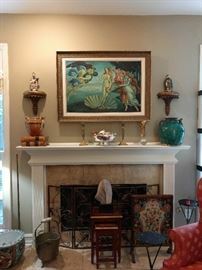 Very comfy couch, cool Italian artwork, inlaid wooden side table, Asian cloisonné vase and porcelain figure. 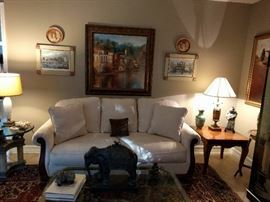 Check out the elephant on the coffee table - it's special! Gorgeous 1940's mahogany buffet, with leather inlay top and two door fronts, opens to a bar! Closer detail of the 10' x 13' Persian Heriz. 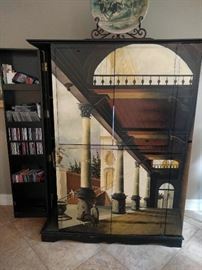 Hand painted entertainment armoire, with two door that open on each side (left side is open) to hold albums, CD's, 8-tracks and odd Hot Wheels cars. 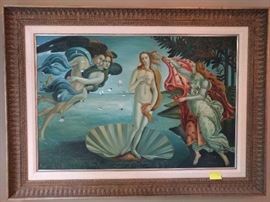 Very nice, hand painted copy of the original "The Birth of Venus" by Sandro Botticelli. 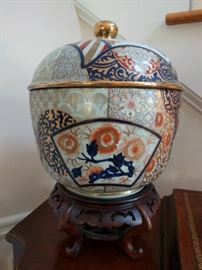 Fantastic Imari lidded jar on wooden stand - measures 15" tall. 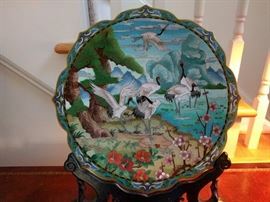 Stunning (really) cloisonné plate, on fitted wooden stand. Proud Mary lion lamp, on wooden base. 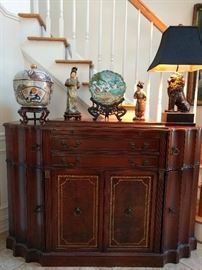 Lovely 1930's mahogany sideboard, with matched veneers, topped by a pair of vintage Cybis figurines, and a huge Holbein book "The Queens Collection at Windsor Castle". Pristine 1940's mahogany dining table, with three leaves and six side chairs, by Drexel. 1930's fruitwood veneer armoire, in exceptional original condition. French bergere chair with silk upholstery and feather cushion. Heavy wrought iron/beveled glass coffee table, from the film, "The Blind Side", with Sandra Bullock. 1930's vintage double bed, that matches the chest-on-chest. Nice art deco (not repro) desk lamp. Marble-topped 3-drawer chest, with vintage chalk figure hussy and jade lamp. Vintage swivel shaving mirror on chest. 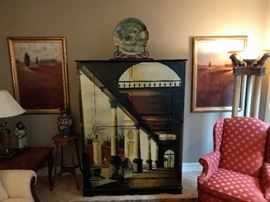 Bad 3-drawer bombé chest - must be from Picasso's mustard period. Vintage spelter harp girl. It's kinda cool, seems to be a lamp base. Re-string her harp and she'll follow you anywhere. Yep. Lovely breakfast table with extra heavy beveled glass top and four heavy iron/wood side chairs. Here's a better shot of the base, you can also notice the thickness of the glass. All kinds of china, cloisonne, vintage porcelain figurines and vases. VERY complete set (152 pieces) of Royal Worcester "Blue Medallion" china. Set includes: -16 Dinner Plates -16 Soup Bowls -28 Coffee Cups/29 Saucers -12 Bouillon Soups -16 Soup Bowls -28 Dessert Plates -15 Bread & Butter Plates -3 Oval Vegetable Bowls -18" Serving Platter -2 Round Serving Bowls. Set of eight vintage Austrian china oyster plates. 51-Piece set of S/P Rogers "Eternally Yours" flatware + mahogany chest. 68-Piece set of gold plated flatware, from Davison's, Yes THAT Davison's + mahogany chest. Very nice wall-hung wrought iron table, with onyx top. 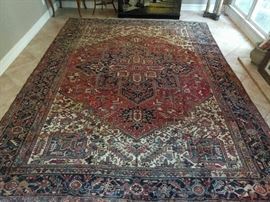 Vintage Persian Heriz rug, 100% wool face, hand Woven, Measures 3' 10" x 6' . Signed lithograph "The Rising Wind", by Montague Dawson ; frame measures 34" x 48". Pretty vintage persian Arak rug, hand woven, 100% wool face, measures 4' 8" x 6'. Very nice wrought iron/glass etagere; measures 6' 6" tall x 5' 4" wide x 10" deep. Vintage tribal Persian Lilihan Sarouk runer, 100% wool face, hand Woven, Measures 3' 7" x 10' 4".